You have been together for a few years and the anniversary is fast approaching. Make it a day to remember by giving one of these fantastic gifts! Whether you have been together for one year or twenty years, anniversaries should always be a cause for celebration. Yes, that means that you should not be afraid to splash out, throw caution to the wind and reach the upper echelons of whatever budget you may have in mind. Gold, silver, or jewellery decked out with precious coloured stones can be given anytime so if you see the perfect present, but don’t think it fits the anniversary year rules, don’t’ worry. Buy it anyway and we guarantee that she will love it! If you have to be realistic about budget, you need to give a present or arrange a special event on a shoestring. Rack your brains and come up with something brilliant that she will cherish. Gift ideas could be something as simple as a new bottle of her favourite perfume, wrapped and delivered with a kiss! If she is running low on make-up, how about restocking her collection with a few key items that you know she depends on? Hide them in her make up bag and let her be surprised when she comes across them! There are classic anniversary gifts that can of course be given to your loved one. Here we are talking about a bunch of her favourite flowers and/or her favourite chocolates. These are two staple gifts that will always be welcome. But don’t rest on your laurels - add a twist to bring this gift to life. Here are a couple of ideas. Open the chocolate box and remove a coupe of the sweets, replacing them with small gifts like a ring or a pair of earrings picked up from your local jewellery shop - they don’t have to be particularly expensive. Flowers always come with a small card that normally contains a kind word or two. Add a twist - fold up a gift certificate and place it into the envelope – she really won’t expect this when she opens it! You could always attach a couple of small gift boxes to the stems of the flowers. All you need is a ribbon to connect the stem and gift boxes. 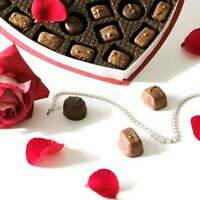 Place a few gourmet chocolates or sweets or even a few small silver trinkets that she can cherish. It might not be a traditional present, but if your girlfriend or wife is really into gadgets, don’t be afraid of giving them a tech-savvy gift! Do you spend a lot of time away from each other? If you do, for whatever reason, be it through work commitments, a laptop or desktop computer is a great gift idea. Get one which comes with a built in web cam and chat software. Wherever you are in the world, you will be able to connect with your partner. This is a cool gadget that will help keep your relationship happy! Load up a multi-media message of you declaring your love for her and explaining why you have given the gift – she will be in awe of your imagination! Another idea is to give a digital camera or video camera. Load it up with some photos or videos of your key moments. This might have been shots taken on holiday or even at your wedding. If your budget is high, you can even include some holiday tickets in the package with the camera. Whether it’s a city break or an exotic beach holiday, she will definitely be impressed! Anniversaries are about celebrating your time together but if your other half is feeling stressed about work or about life in general, it might be a good idea to treat her to some “me time”. That might equate to a trip to a local beauty salon or spa, a brand new hair cut and colour or a trip to a department store where she can take advantage of the personal shopping service. Finish the day or treat off with a delicious meal out at your favourite restaurant. If money is no object there really is no limit on what you can do for your anniversary. A trip to the city, to see a top show and stay at a five star hotel, a limousine ride around the sights or a table at a famous restaurant – all of them will be within reach. Before you go ahead and make a booking or head to the shops, do think. What would she really love to do? Has she ever covered a particular item? If you can remember previous conversations, make those dreams come true! Anniversaries are a special celebration. No matter how long you have been together the fact that you are still in love is a good reason to splash out. Get a thoughtful gift and create a wonderful day that will make her fall in love with you all over again!